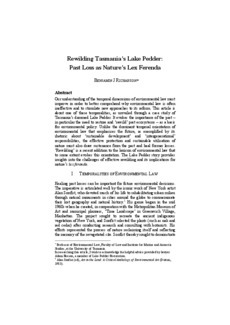 Our understanding of the temporal dimensions of environmental law must improve in order to better comprehend why environmental law is often ineffective and to stimulate new approaches to its reform. This article is about one of these temporalities, as unveiled through a case study of Tasmania’s dammed Lake Pedder. It evokes the importance of the past – in particular the need to restore and ‘rewild’ past ecosystems – as a basis for environmental policy. Unlike the dominant temporal orientation of environmental law that emphasises the future, as exemplified by its rhetoric about ‘sustainable development’ and ‘intergenerational’ responsibilities, the effective protection and sustainable utilisation of nature must also draw sustenance from the past and heal former losses. ‘Rewilding’ is a recent addition to the lexicon of environmental law that to some extent evokes this orientation. The Lake Pedder story provides insights into the challenges of effective rewilding and its implications for nature’s lex ferenda.